Salman Khan is not just known for his acting skills, but is also known for his love for bicycles. The Sultan star has never refrained from hitting the streets of Mumbai with one of his bicycles by Being Human. 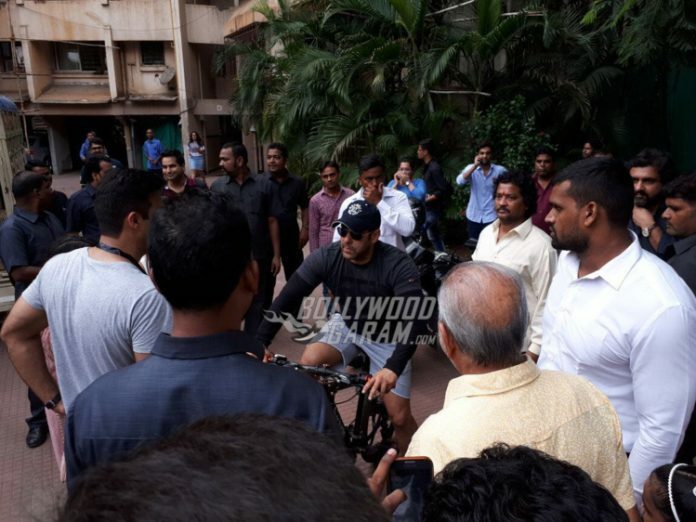 Salman was snapped on the streets of Mumbai on his Being Human Bicycle on September 26, 2017. The Dabangg star looked great in a black pullover and blue shorts as he made his way. Salman also launched the eleventh season of the popular reality show Bigg Boss at a grand press event in Mumbai. The show will be premiered on October 1, 2017 and this will be the third time the actor will be playing the host. Salman has never disappointed as the host of Bigg Boss and has always kept the audience and the contestants entertained. The previous season was one of the most popular seasons as it showed the clash between the celebrities and the commoners, who were allowed inside the house. Salman also made it clear during the launch event and said, “Well, I want everyone to behave properly. I know it is not easy considering the situation where all the participants are coming from different background and mingling the first time; there are friendship, politics, people deals with the tricky situation. However, they should behave.” This statement has surely indicated some drama and entertainment for the upcoming season.